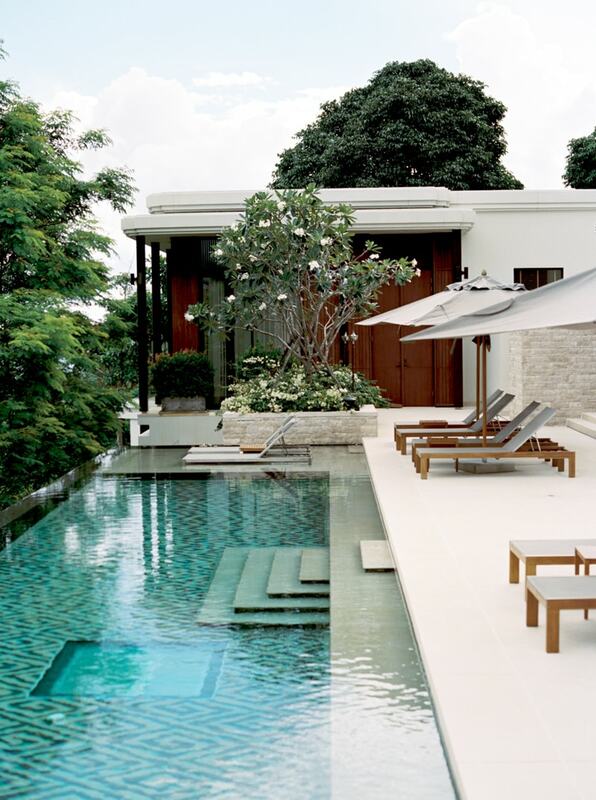 Phuket Thailand Elopement. In this elopement styled shoot, the beauty of Thaliand reminds us that an intimate elopement is truly a gift for those couples hoping to wed without stress or worry. Set at the gorgeous Anantara, this private elopement scene is created with romantic hues, tropical flowers, and of course, a stunning couple. 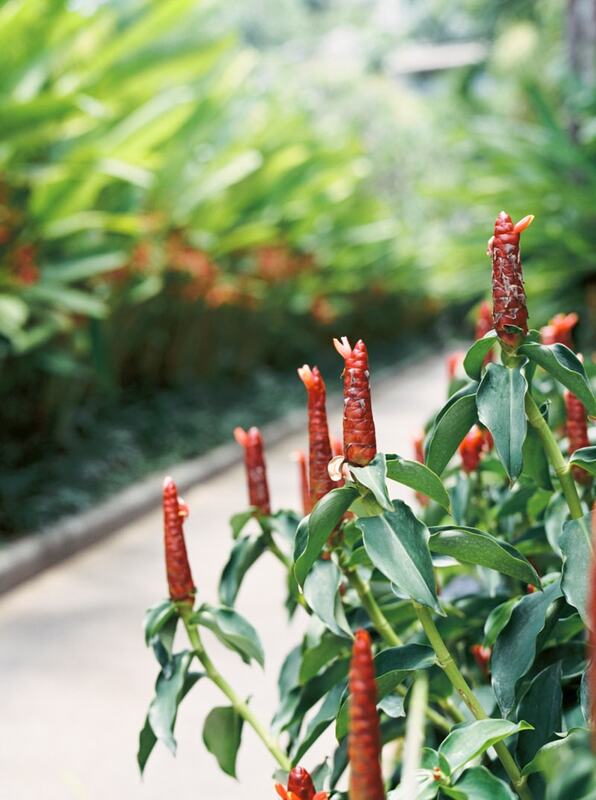 Who wouldn’t want to get married in paradise, where you’re surrounded by lush plant life, hidden walkways, and your own private pool? 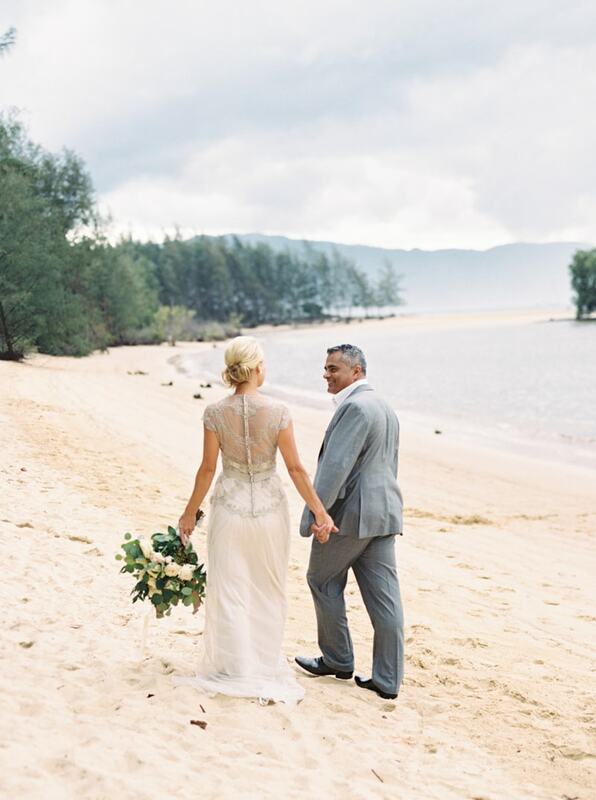 In lieu of a fluffy, over-the-top design, the bride dons a magnificent silver beaded gown. It’s the perfect silhouette to travel abroad with, as well! 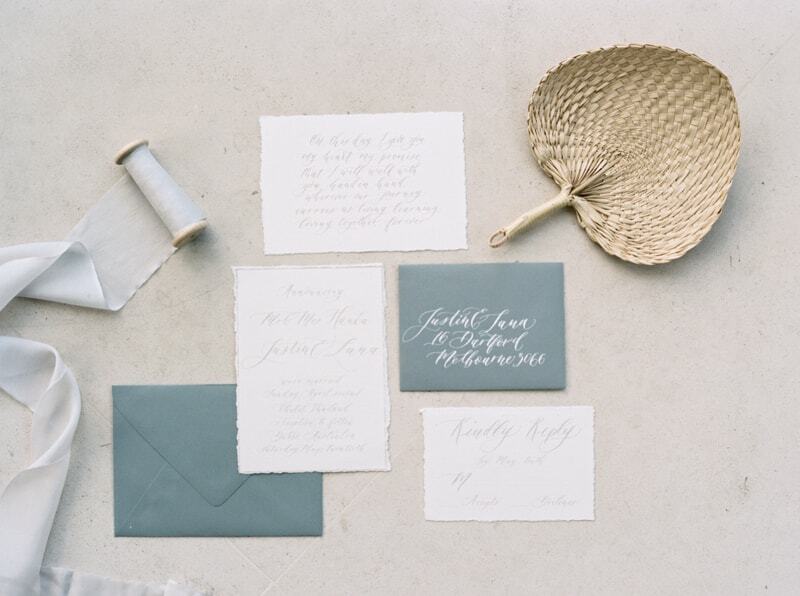 Gray is the color of choice and it’s evident with the splash of gray hues on the invitation suite. Torn parchment and classic calligraphy help round out this lovely collection. 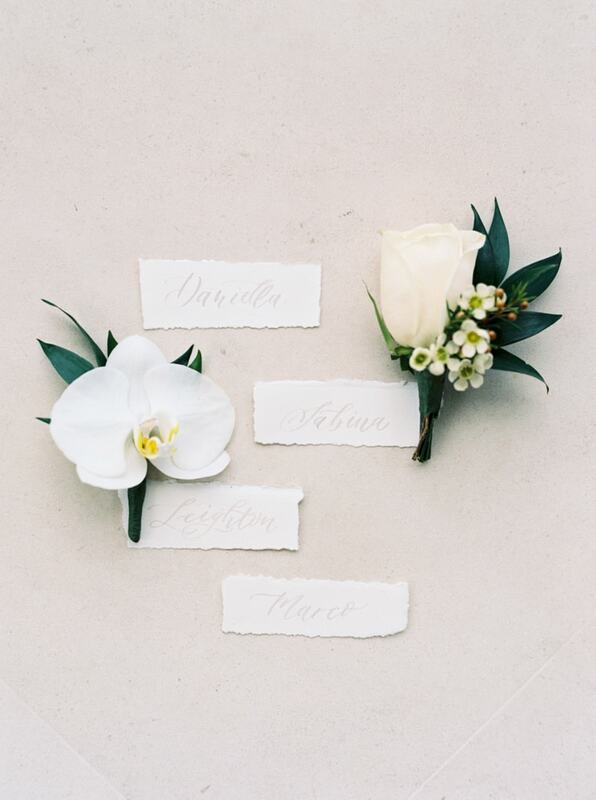 The team also uses calligraphy on the place cards, seen with boutonnieres fashioned from orchids and roses. Surrounded by the crystal blue waters and towering palm trees, the couple’s ceremony takes place right on the sand underneath a wooden floral arbor surrounded by silver lanterns. They celebrate together with an elegant beachside picnic, complete with flowers, candles, and white pillows. 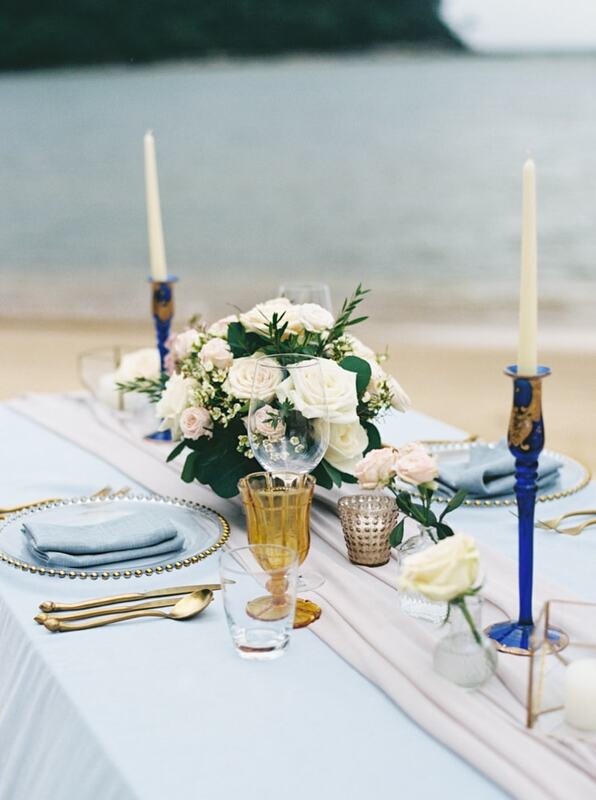 The table is adorned with a blush runner, an assortment of pink flowers, and gold geometric candle holders. The reception made for two starts with a light blue table linen and gray runner. 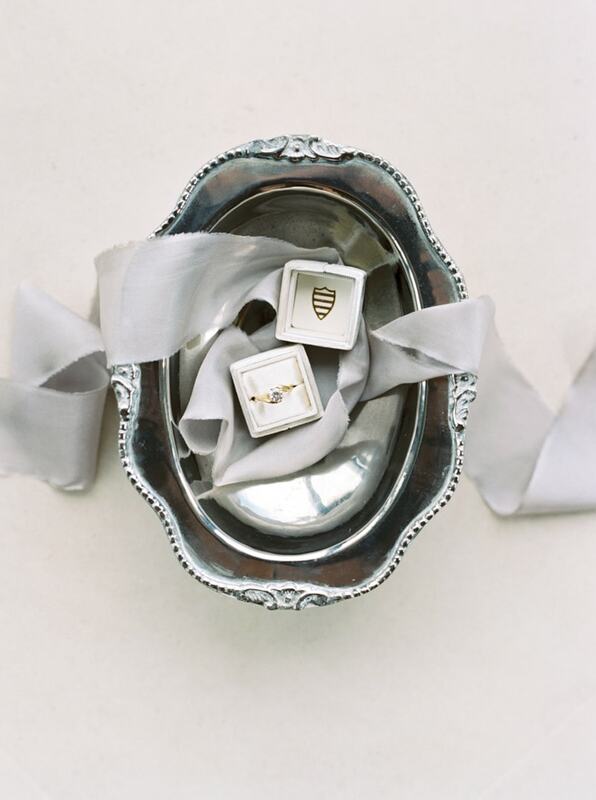 The bride and groom’s place settings include clear plates with gold rims, paired with gold flatware and ornate goblets. 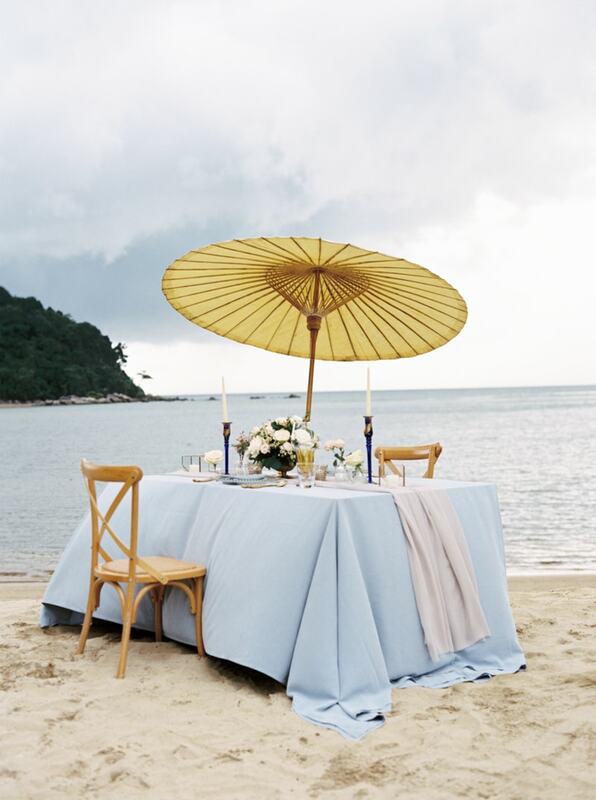 The beachside table rests under a parasol to block the sun, while two wooden chairs await the couple. A centerpiece and two royal blue candlesticks complete the tablescape. 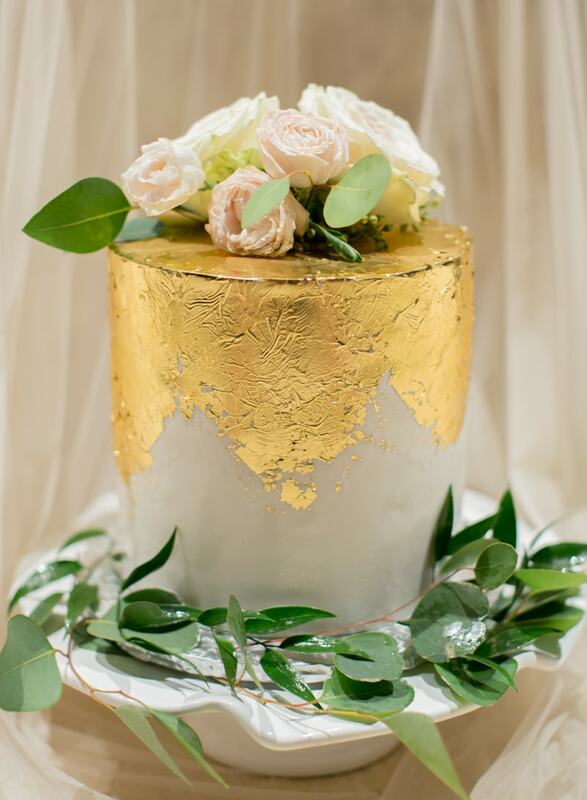 The cake is a luxurious creation featuring a single tier covered in gold leaf and topped with roses and eucalyptus. 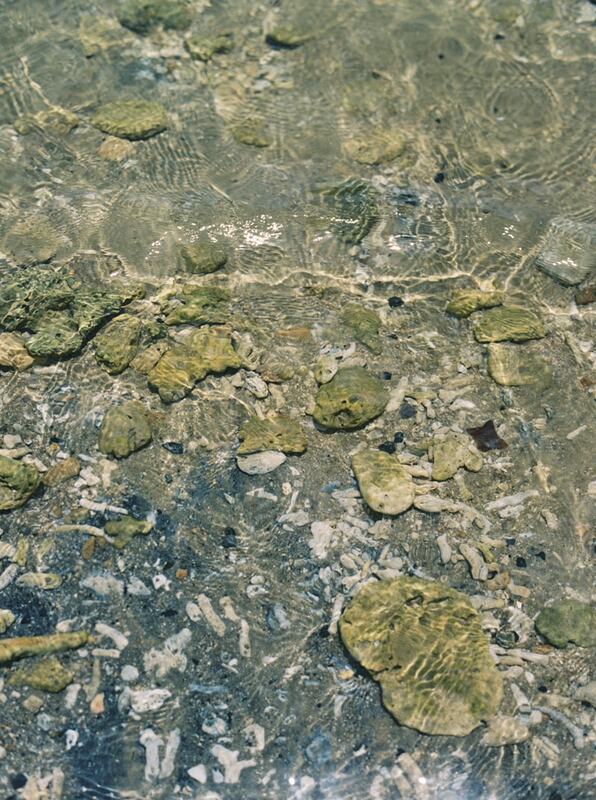 The sea mirrors the cyan sky as the couple walk hand-in-hand along the surf. The bride’s romantic bouquet and her husband’s beaming smile are as impactful as the breeze that sweeps across their faces. 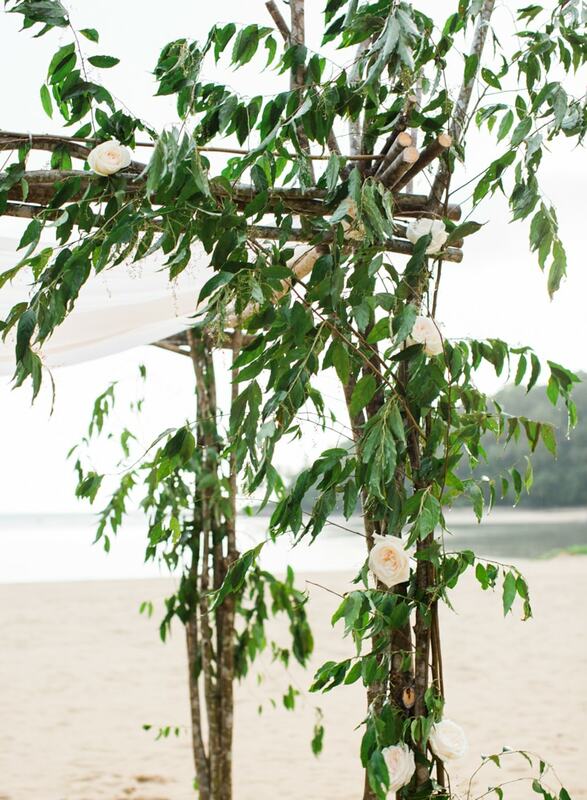 One final nod to this special wedding scene in Bali is a banner proclaiming “We Eloped” held up by two tiki torches. If you’re the kind of couple who yearns to get married with minimal stress, drama, and plans, then an intimate elopement may be for you. 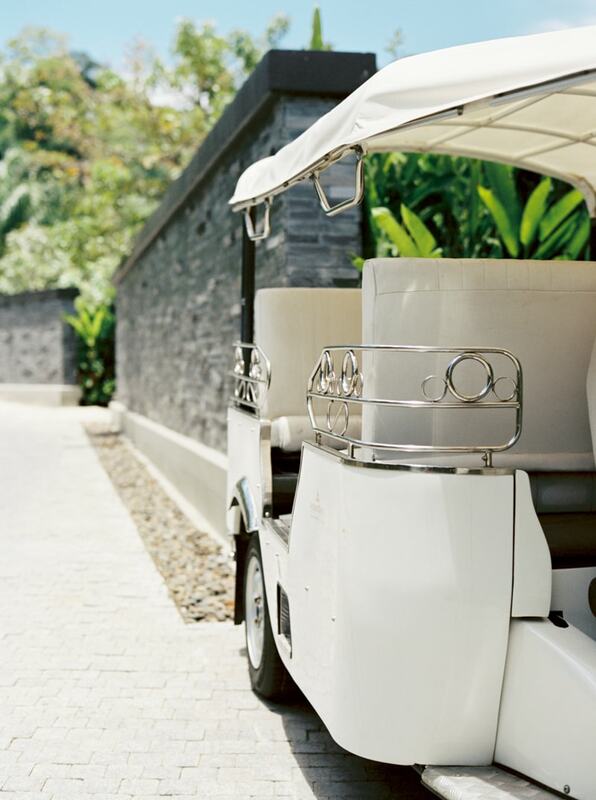 Whether it’s a destination or just right down the street, escaping for your own private ceremony is as romantic as it gets.